Ava DuVernay made a surprise movie this year. The acclaimed filmmaker (who should be “Academy Award-nominated director” after her beautiful 2014 film Selma) has made a movie so powerful, so infuriating, and so important that I had a hard time sleeping last night after seeing the film because it resonated with me that much. 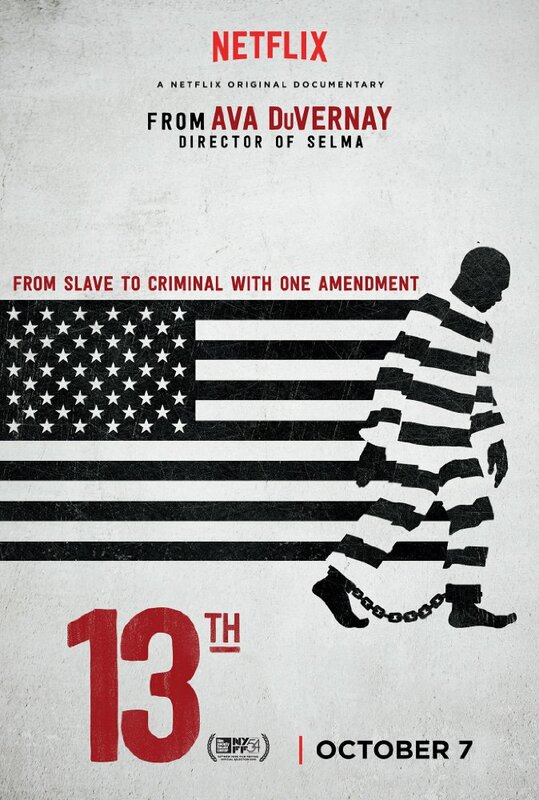 That film is 13th, a documentary about how the United States was able to use modern slavery against black people after Abraham Lincoln added the 13th Amendment to the Constitution that prohibited slavery in this country. The United States has been able to use modern-day slavery in the form of Jim Crow laws, segregation, mandatory minimums, and so on. DuVernay touches on all of these topics, and how our history has gotten to where we are now. 13th tells the story with interviews ranging from civil rights leaders, professors, scholars, and even politicians. The film doesn’t use any new wild filmmaking technique to tell this important story. It feels procedural, but that’s by no means a criticism. 13th is the most important film of not only the year, but of the decade. If you’re an American, especially an American that’s voting in the upcoming election, you’d be doing yourself a disservice not seeing this film before November 8th. 13th spans over a century of oppression against black people in the United States. It opens with post-Civil War talk and how D.W. Griffith’s The Birth of a Nation set back relations between black people and white people in the country by several decades. That film, as important as it was to the creation of cinema, was a very racist movie that glorified the KKK and portrayed black people as rapists and killers. And throughout the film, as DuVernay describes the history of African-American life post-13th Amendment, a number showing the rise of mass incarceration after Lyndon Johnson had signed the Civil Rights Act of 1964 and the Voting Rights Act of 1965. Richard Nixon pledged to show “Law and Order” in the country, and begun the “war on drugs”, which was used to specifically target black people in urban areas of our country. Reagan continued this practice in the 80s with making harsher sentences for African-Americans caught with crack than with a couple of ounces of cocaine. This systemic racism continued all the way through the 90s with Bill Clinton signing the Violent Crime Control and Law Enforcement Act of 1994 into law, which put into place the highly controversial “3 strikes” felony law that would send away people for years after three felonies. And while both Bill and Hillary Clinton have apologized for this years later, it’s a bill that still has repercussions to this day. The actions of administrations in the past have ruined the lives of millions and minorities in this country, and it’s sickening to look back on what our country has done to African-American and Latino people in terms of mass incarceration in the past few decades. And that’s really where this election truly scares the hell out of everyone, including myself. A candidate like Donald Trump (who is featured a couple of times in the documentary in a chilling sequence toward the end of the film) promises to be a “Law and Order” candidate like Richard Nixon, which is a terrifying thought. Nothing will happen in terms of this problem if a candidate like Donald Trump becomes President of the United States. Judging by how African-Amercians are treated at this man’s rallies, it will only get worse in this country. Apologies if my political beliefs don’t necessarily a-line with yours, but this is exactly the kind of conversation we need to be having in this country, and Ava DuVernay’s powerful film is a great example of starting this conversation between us. The film is streaming exclusively on Netflix, so if you have an account feel free to go watch it any-time you want. I especially urge to you to watch this film if you’ve somehow gone through the past couple of years thinking that race relations are pretty good in this country. It’s better than it once was, but as a country we can do much, much better. Also, if you’re one of these folks who can’t understand why a black man won’t stand for the national anthem, or why Black Lives Matter has become as big a movement as it has, or why the Donald Trump presidential campaign is as terrifying to minorities across this country (including myself), then I recommend you see 13th, and let me know how you feel about these topics after viewing the film.